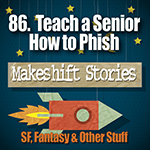 To eke out a meager living, Neela, a senior in her early 80’s, must rely on her social engineering and hacking skills to phish. While she is running a phishing scam, Adam, another guest at the senior complex where she lives, confronts her about her use of the public access terminal. He then admits that he too is running an online scam, but that something odd is going on in the retirement home’s computer system. While confirming what Adam has discovered, Neela notices that they are not alone. Someone else has been manipulating the financial records.